You are cordially invited to celebrate this special moment with us! Let's pop the corks and enjoy an entertaining evening together! Let's celebrate! For half a century now, we have been developing and implementing products and solutions to improve and smoothen public transport. To celebrate this milestone and as a thank you for the many years of loyalty and trust in our company, we cordially invite you to our 50th Anniversary Celebration, which will run alongside InnoTrans 2018 in Berlin. We look forward to raising the glasses with you for the next exciting stage of our joint journey into the future of mobility together with you. Make sure you register today as the number of participants is limited. See you in Berlin to celebrate together! 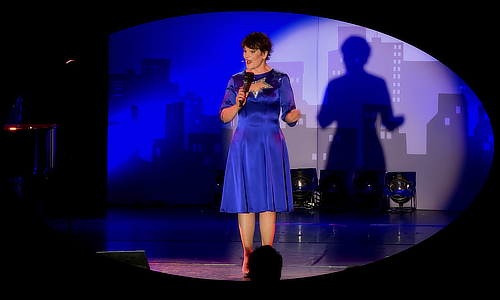 Gayle Tufts, a great German entertainer with American roots will thrill you with her music and stand-up comedy! "She rocks the public…" "She makes me feel really happy…" "She creates those magic moments…"
With your InnoTrans entry ticket, you can use public transport for free. Please register early to secure your seat. The number of participants is limited. Registration closes August 31st, 2018. Please complete the form by person. We look forward to seeing you there!